I first watched Navtej Johar perform in 1995-96 in Bangalore when he was part of the dance company Spanda and some curiosity has always led me to follow his work. 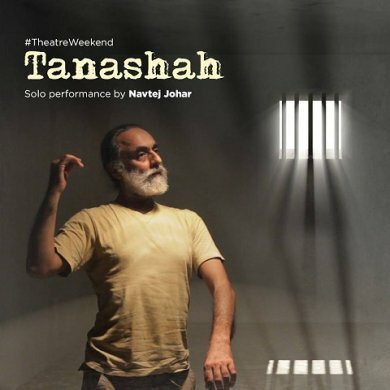 A few weeks back, on reading the preview about the dance theatre presentation 'Tanashah' that he was to present, I also decided to do some little homework and that was to read up the essay "Why I am an atheist" written by Bhagat Singh while he was in Lahore jail. What got me thinking was that along with an evolving artist, there is the journey of the spectator too and to that extent, there lies a great responsibility on the part of the artist to awaken more curiosity in the spectator. Even as the poignant martyrdom day went past last week, the image of the three young heroes being walked to the gallows in the year 1931, moves beyond words. 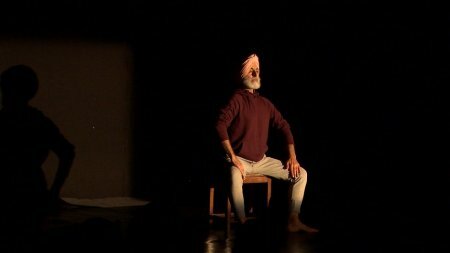 For someone to envisage Bhagat Singh into a beautiful dance theatre production, gets me to reflect upon whether poetics inspires dance or is there dance that pervades in a self that searches poetry. Navtej gently led the audience through his fascinating exploration of Bhagat Singh's transformation from a believer to a non-believer. The slow movements of him tying the turban as he hummed the sarali varisai depicting Bhagat Singh's initiation from the Sanatana Dharma to the tenets of Sikhism had a mark of great poise. But this too never gave Bhagat Singh answers to his quest. The narration reveals that his stand, pointed out more to sensitivity as a core word in a non-theistic framework. And while the audience was engaging with the artist in Bhagat Singh's journey, the dancer artist brought to the fore the protagonist's youthful desire. As Navtej puts it, "On the one hand, it is inspired by Bhagat Singh's clarity and fearless stance of resistance, and on the other, it is based on the courage to desire passionately..." There is an interconnectedness in otherwise apparently different themes that the artist chose to present, in weaving a tapestry of different linguistic and cultural milieu. Andal and Heer who are geographically distanced in our imaginations have the same 'courage to desire passionately'. The audience here watched one of the most beautiful moments of the depiction of Andal making a garland for her lord and wearing it herself before she can offer it to him. G. Elangovan's rendition of 'Indheeran ullitta devar kuzhaam yellam...' matched Navtej's most subtle abhinaya. Much has been said about the notion of transgression here. Uma Chakravarti in her article in Manushi titled, 'The world of the Bhaktin in South Indian tradition: the body and beyond', points out, " ....she (Andal) violates our very understanding of reality so that we enter the more magnanimous realm of experience she inhabits." Bhagat Singh is said to have read and sung Heer, the poignant ballad in Punjabi literature. The musicality and the essence of Heer suffuses the existential topography of Punjab. In singing verses of this ballad, the artist transposed the attention so evocatively, which left me wondering how art directs us into looking at different sensibilities. The dance theatre production crescendoed in the depiction of the impending death and the unequivocal angst. While Elangovan sang 'Ososi namadinunnayatti,' the anupallavi of a beautiful padam, Navtej harmonised with the singer, sustaining one swara. The unique padam, 'kasiki ki poyenu' by Muddu Natesa talks about a distraught lover, a male protagonist. The depth of raga Mukhari lent itself to the intense and contained movements of the artist. Yet again flowers were strung into a garland and this time it was Heer who wore it to see herself before a consummation that was to be. 'Aave veera ranjhayave' sung by Madan Gopal Singh brought a close to the show. Words of appreciation go out to Navtej, who has said in an interview: "The reason I love dance is because it offers me a poetic space for self-reflection." Incidentally Bhagat Singh's essay was translated into Tamil by P. Jeevanandham and was published in 1935. And when the English translation went missing, it was translated from Tamil to English. Navtej plans to do a production of 'Tanashah' in Tamil. Jaya Rao Dayal is trained in Bharatanatyam, and in the last decade, she has been pursuing research in Indian aesthetics. She submitted a dissertation to Jnanapravaha in Mumbai as part of a post graduate program in Indian aesthetics.